If you were to ask a rock fan on New Year’s Eve 1948 which artist seemed poised to have the biggest year in 1949 the smart money would’ve been on The Orioles. Everything about them seemed to predict imminent greatness, that is if they hadn’t already achieved it. In just six months on the job they were the possessor of two huge hits, one of which reached #1 and even crossed into the hallowed Pop Charts. Their style itself also fit perfectly within the rock spectrum, particularly as it related to their equally youthful fans, yet it was a new variation of rock, one that introduced the emotionally vulnerable ballad style to the medium, delivering soul-bearing lyrics with a perceived authenticity that left listeners drained yet eagerly coming back for more. Much of this came via original material, largely written by manager Deborah Chessler, another important factor which would potentially give them an added advantage going forward because they wouldn’t be reliant on finding songs to suit them but rather could craft their own image as they saw fit. You could easily envision them, a good-looking group of kids only in their early 20’s with no baggage from long middling careers to try and shed themselves of to stay relevant, becoming rock’s most reliably steady act for years to come. There truly appeared to be no limit to their potential. Yet by the time spring rolled around I’m sure there’d be many who placed their bets on The Orioles wishing they could take their pick back. What had seemed so promising, so inevitable almost, went haywire almost as soon as the calendar turned on New Year’s Day. Every decision they made over the next few months was not only a bad one, but COMPLETELY wrong. Three sides were released in the first two months of the year and all three were tepid offerings designed to appeal to the mainstream pop music marketplace… one they foolishly thought they’d won over with their debut, It’s Too Soon To Know when it unexpectedly managed to hit #13 on those Pop Charts. Now it seemed they were doing all they could to satisfy the white adult constituency that made up that audience. They promptly failed in their attempts and they failed BADLY. For starters they failed aesthetically with the material itself, which was lightweight and unchallenging. They also failed commercially as the sides didn’t live up to the sales expectations based on the overwhelming success of their earlier hits. Most crucially though they failed their fans, the genuine fans, the ones who had made them stars, who embraced them so fervently that it lifted their first record to undreamed of heights. It hadn’t been the pop audience who’d done that, it was the core young black audience who proved to be bigger than anybody could’ve believed. It was on THEIR shoulders The Orioles had climbed and now it was their backs they were stabbing in an effort to make it to the so-called promised land of white acceptance. The audience who lifted them up not so long ago now let them fall back to earth. So we have a standoff. On one side is a young fan base, understandably hurt by recent events but having already proved ready and willing to give their hearts to somebody they can call their own, someone from their own community sharing their worldview and reflecting their experiences. On the other side we have the artists capable of forging a deep seated and lasting emotional connection with listeners of their generation, who’d already done so and been rewarded for it, but who had to be reminded just who they needed to focus on in order to keep their stature from slipping. And so, in what coincidentally happens to be the review marking our first year anniversary on Spontaneous Lunacy, we have a record which encapsulates everything we’ve covered to date when it comes to charting rock’s course… most of all the importance of maintaining an unbreakable connection between the artists and audiences that will sustain them both for an eternity. 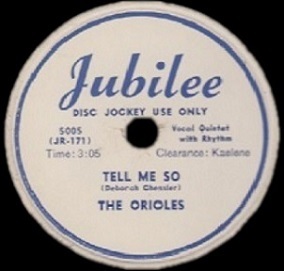 To achieve this they went back to the first song among Deborah Chessler’s compositions that she’d gotten recorded, a plaintive ballad called Tell Me So which Savannah Churchill had cut in March 1948, a month before Chessler and The Orioles even met and first got together. Maybe as could be expected for a novice songwriter it’s simple, though by no means simplistic, and is built on strong melodic and thematic similarities to the song that would soon propel The Orioles to the top of the charts. But similar though it might’ve been and thus hardly a bold choice for them to make in an effort to right the ship, the song played heavily to The Orioles strengths, namely the fragile yearning of Sonny Til, giving him free reign to drench it with undercurrents of emotions until the listening audience was hanging on every word. 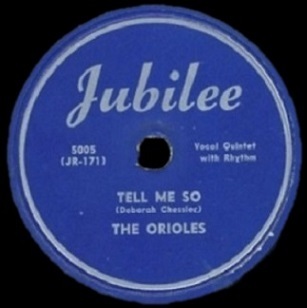 Sure enough it did the trick as Tell Me So became the group’s second chart topper, remaining in the Top Ten for over two months longer than It’s Too Soon To Know had, and in the process confirming The Orioles as the leaders of the rock field at this stage of the game in 1949 after all. So its success therefore would appear to validate their choice, but would the performance of it validate that success? Here’s where it gets tricky and thanks to that we get to have another of our renowned sidetracks! (c’mon, stick with me here, it’s important). In rock history there are only a handful of legendary songs where the most well known version today by the artist who made it famous is NOT the original version that everybody heard when it was released. Now there are many songs that had the tracks shortened for single play (Sam Cooke’s A Change Is Gonna Come, The Doors Light My Fire, etc.) and in the years since it’s been the longer unedited cut that has been most widely heard, but that’s not what we’re talking about. Nor are we dealing with remakes by the same artist, such as The Dells with Oh What A Night, or live versions that go on to be the preferred take (Paul McCartney, Bob Marley, Peter Gabriel, Deep Purple all having such songs in their canon) or remixes of a single such as with Kid Cudi’s Day ‘N’ Night (Crooker’s remix). What we’re referring to here is a totally different studio take done at the same general time being substituted for the original single on re-issues and for radio play years later where THAT alternate version becomes the well-known one, obliterating the original. It doesn’t happen often, but it does happen. Professor Longhair saw his original 1953 single Tipitina left off a 1970’s-era Atlantic Records album of Longhair’s 1950’s tracks, the compilers choosing instead an alternate take that has gone on to be used in virtually every Longhair anthology and hits collection ever since. Few, other than those who own the original single, have even heard the correct version. More recently, though still more than twenty years ago now, Pearl Jam used a re-recorded version of Evenflow for the video and that’s the one on their Greatest Hits album, the one most people know. You could even throw in the fact that Bing Crosby’s original 1942 version of White Christmas, the biggest hit in recorded music history, was replaced by a 1947 re-record that boasted better fidelity and as a result is the generally preferred version ever since, though the 1942 take isn’t exactly obscure. 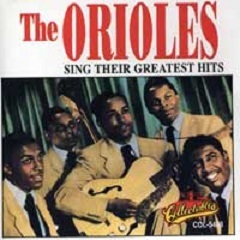 But in rock the first example of this is undoubtedly Tell Me So where The Orioles cut different takes of it on their first two recording sessions, one in June 1948, the next in the fall of ’48 making an adjustment in the arrangement in order to make it more similar to their debut which was streaking up the charts by that time. The original take on it from their first ever recording session is heard here, courtesy of Spotify. The difference is primarily found in the bridge. This original take had them simply humming a refrain sans lyrics, something that seems like it’d be hokey, or at least unfinished, like they forgot the words or something, but it actually works brilliantly. It gives the song a sense of airy wistfulness that makes it seem like they’re thinking up the song as they go along, caught up in the emotions of the preceding lyrics wherein Sonny Til ruminates on the confusion of actually knowing for sure whether the girl he’s with is the right one. It also highlights their amateurish background. They wind up sounding more authentic to their audience because of it in a way. They’re not polished artists, distanced from their listeners by a veneer of professionalism, but rather they come across as no different than those buying the record and that – more than anything – was part of their appeal. On the remake cut in October that got tabbed for the single release they added a sung bridge by George Nelson trying to better replicate the framework of It’s Too Soon To Know, but since the lyrics he sings are just repeating what Til has already delivered there’s no change in perspective offered. It sounds more polished I suppose but whether polished is what they should be going for is up for debate. In years since it seems that the first version, the humming version as it’s come to be known, is the one more often re-issued. It’s included on their first greatest hits package issued in the CD era with no reference to it being the unissued original. It’s been used on other compilations since and is the one found most frequently on YouTube which is probably where most newcomers to the group go to hear their work when first encountering them. I don’t know exactly how or why this happened. Was it a case of somebody unknowingly grabbing the wrong tapes for a project along the way which snowballed when the next person came along to put out an Orioles collection and having heard that one more recently figured it was the original single release? Maybe. Or did someone decide that the humming version was indeed the better cut and made a subjective decision to use the one they personally found more appealing? If so, as wrong as they were for re-writing history to a degree, they might not have been wrong in their assessment. The humming version IS better. The one drawback to much of The Orioles work is their sticking to the same basic structure each time out which had Nelson merely repeating a stanza in each bridge that Til had already delivered in the verses. The first time out on It’s Too Soon To Know it worked well because it was unexpected but now it’s becoming old hat and they’re in need of changing things up, maybe adding an instrumental break rather than more vocals. So the humming refrain serves that purpose and works wonderfully as a result. But that’s not to say the released version doesn’t have plenty going for it too. Which finally brings us back to the review of the record in question, though if you’ve been with us this first year through countless detours in the reviews you knew we’d get to sooner or later. Despite Nelson’s appearance on this version in the bridge, Tell Me So is Sonny Til’s show through and through. Every aspect of his skills are on full display here, from the emotional commitment to the storyline to the frequent flourishes he tosses in – ones which differ noticeably at times from the first recorded version, an improvisational display which lets you know that he was going on instinct in the studio and which adds immeasurably to the feeling he conveys. His voice subtly plays with the melody so if you’re more familiar with the humming version you’re sure to be caught off guard by the slight changes. The most dramatic shift comes after Nelson’s part when Sonny re-enters the picture, his voice caught slightly off mic as he starts his impassioned “Well, well, welllllll” which is something he dreamed up as it was cut no doubt, maybe because he WAS too far from the mic and would’ve missed his cue unless he added that to cover his late entrance, but he sells it with everything he’s got and it doesn’t seem the least bit out of place. If anything it adds to his urgency over the question he’s posing to the girl, as if her reply has the power to make or break him, yet by being so naked with his desire it has the appearance of giving him confidence that she’ll say she does want him after all. The other changes are easier to spot and not all for the best either. The backing on the “original” was guitar based and while it was limited mostly to the intro, it set the song up better than the halting piano used here. 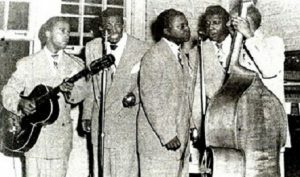 Once they began singing on the first take of it Tommy Gaither’s guitar faded away and the voices provided all the backing Sonny Til needed by using a nice blended wordless harmony. On this, the official single, the backing is carried by stuttering piano triplets which sort of subverts the melody somewhat, though they’re certainly interesting enough in their own way to not detract from the song at all. Since the audience at the time would’ve never heard it presented any other way this wouldn’t have any impact on their ability to enjoy it but the earlier version flows a little better without that. We also have Alex Sharp’s floating tenor featured more here at the expense of the other group members who recede to the background even more. When they appear it sounds more like a midnight Christmas Eve service than anything, probably using only one vocal mic which adds to the ambiance, something highlighted as Sharp takes flight briefly from time to time, serving as the counterpoint to Nelson’s distant sounding bridge. Either way though the song itself is flawless. The lyrics might not quite be the work of art that those from It’s Too Soon To Know were, but are still exquisite in their simple directness embodying much the same uncertainty that befalls all new romance. Which version you prefer probably comes down to which you heard first, or at least which you’ve heard more often. For me it’s the humming version, a record I’d give a ★ 10 ★ to without any hesitation. It’s absolutely brilliant. But we’re NOT reviewing that one, only mentioning it for comparison’s sake to the one we ARE reviewing, the one you’d have heard in 1949, the one audiences back then wholeheartedly supported, reversing the group’s fortunes and setting them back on the right course. That’s the one that matters when looking back at rock history, no matter what our subjective tastes may tell us today. THAT Tell Me So… is still a perfect record. Perfect for the time it came out in and the musical realities of the day. Perfect for the audience who needed some reassurance that The Orioles hadn’t forsaken them altogether. Perfect for those who hadn’t any idea that another – superior – Orioles version even existed. Those fans weren’t comparing it to one in the vault they’d never heard – and wouldn’t hear for decades – they were comparing it to other rock releases from the spring of 1949 where it unquestionably stood out as superior to almost everything on the landscape. They were also comparing it to records the group themselves had already released over the previous year, the good, the bad and the ugly, the latter two categories being foremost on their minds as of late. Most importantly they were comparing it to their own expectations when it came to deciding whether to stick with The Orioles in spite of their recently wandering eye and wondering… worrying… if The Orioles could be trusted to stick with THEM if they gave the group their heart once again. I think you know what they decided. The song was too good, the group too sincere in their efforts not to. In that context this was everything that audience could’ve hoped for. Let us credit the Orioles for learning who really loved them quickly, and to their own commercial success. Despite it’s clear similarities to “It’s Too Soon to Know,” I’ve never felt the need to knock points off of “Tell Me So” for that reason. This record gets an “9” from me as well. I just heard the actual single version of “Tipitina” for the first time and now the more commonly heard version with the restrained horns just sounds like a demo. I never would’ve thought that anyone would even consider touching “A Change Is Gonna Come.” I checked that single version out and noticed that the editors cut out verse most explicitly about segregation (“I go to the movie…”). Naturally. Happy Anniversary! I’m definitely looking forward to your future posts. Seriously, as busy as life is today, it’s wonderful to have a simple pleasure to treasure. P.S. Here’s hoping we get to cover “Happy Anniversary” by Tony! Toni! Tone! one day. I shan’t rate it here, but it’s getting a high mark. Leave a reply on "The Orioles: “Tell Me So”"